Picture this (if you want a laugh): Pouring rain, about 45 degrees, and I’d just come out of Eastern Market. The walk back to my office is about 6 city blocks and I had 5 lbs. of salt, a 5 lb. 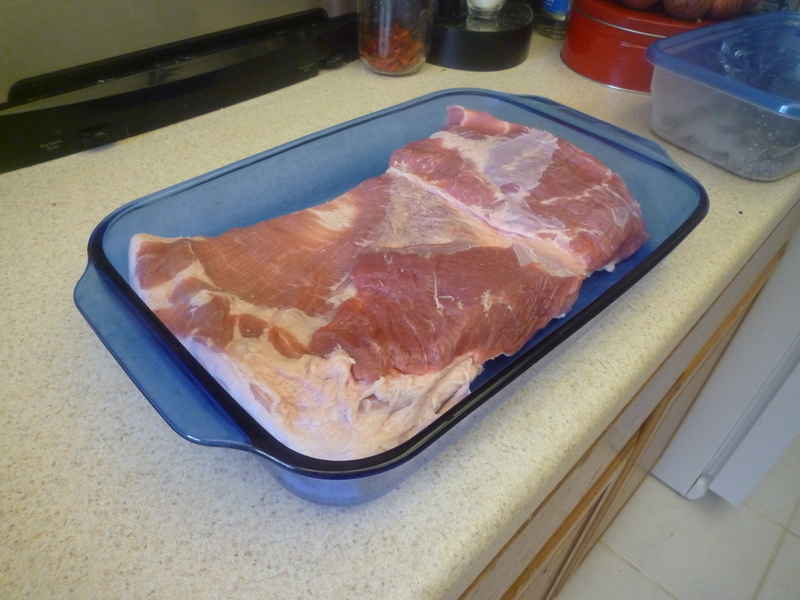 pork belly, a 1.25 lb. moulard duck breast, some spices, a few pieces of fruit, and a hunk of provolone cheese in my cooler bag. Oh, and I had a haddock sandwich from the lunch counter. Even if I had an umbrella, there was no free hand with which to carry it. “You. Are. Brilliant.” I told myself. Admittedly, even if I’d had the forethought to consider how heavy my supplies would be I doubt it would have had much effect on the process. I was far too excited about my new book (Charcuterie: The Craft of Salting, Smoking, and Curing, by Michael Ruhlman and Brian Polcyn) to give much thought to my soon-to-be sore shoulders. Frankly, I was more concerned about locating a suitable place somewhere in the house that was cool, dark, and humid enough to hang cured meat. 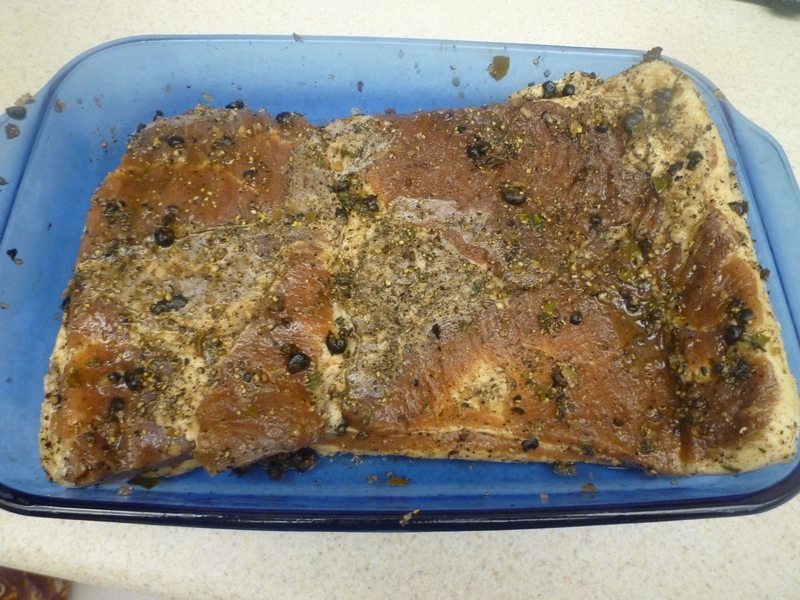 I imagine that few people go home on Friday night with the thought, “Yes, I can’t wait to rub down a pork belly!” But that was my plan last week. I’d wanted to buy Charcuterie for a long time, but only recently convinced myself that the recipes in it were accessible enough to be done by a home cook without much special equipment. 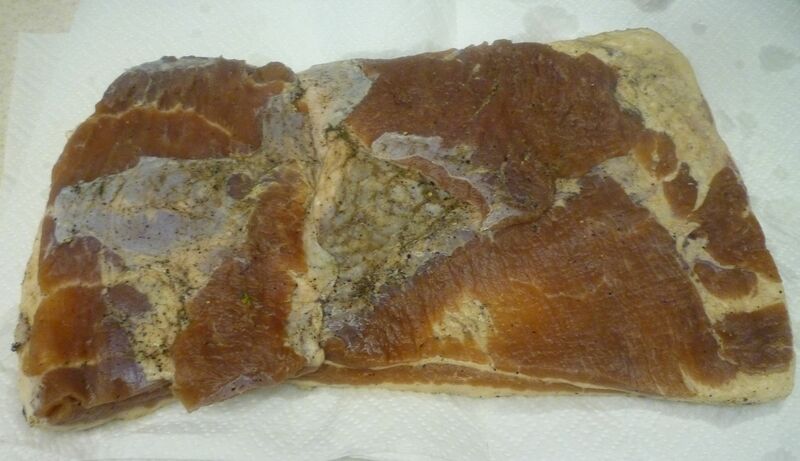 Pancetta is cured, but not smoked Italian bacon. 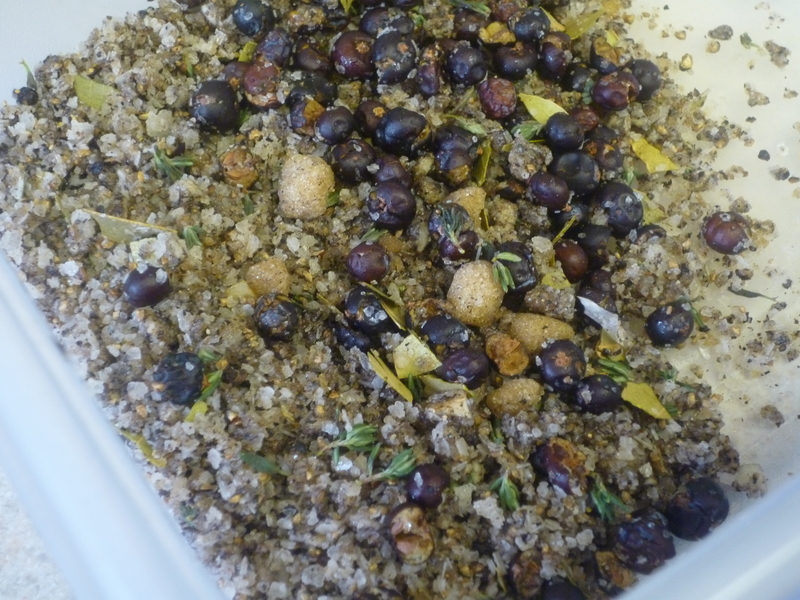 I chose this recipe to start with mostly for its simplicity. Also because you can buy an entire 5 lb. pork belly for roughly the same price as 1 lb. of finished pancetta. Seriously. *Pink salt is a curing salt that contains nitrite and is sold under many names including Insta Cure #1 and DQ Curing salt. You can find it on Amazon.com or at www.butcher-packer.com. Other equipment you may require: Cotton butcher’s twine and cheesecloth. Combine the ingredients for the cure and mix together well. Rub the cure all over the meat side of the belly and place it in a non-reactive container just large enough to hold it. This belly fit nicely in a 9 x 13 in. baking dish. Cover the container with plastic wrap. Remove the belly from the container and rinse it thoroughly under cool water. Pat dry. 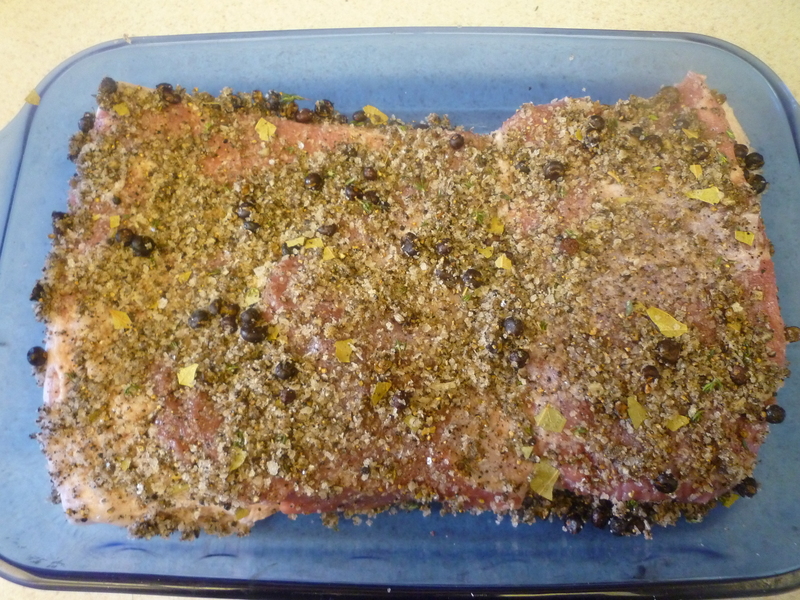 Sprinkle a little bit more coarsely ground black pepper on the meat side if you’d like. From here you have two options: Pancetta is traditionally rolled up jelly-roll style and trussed into a cylindrical shape. However, if you don’t roll it tightly enough, air pockets can form inside and cause mold growth (ew). 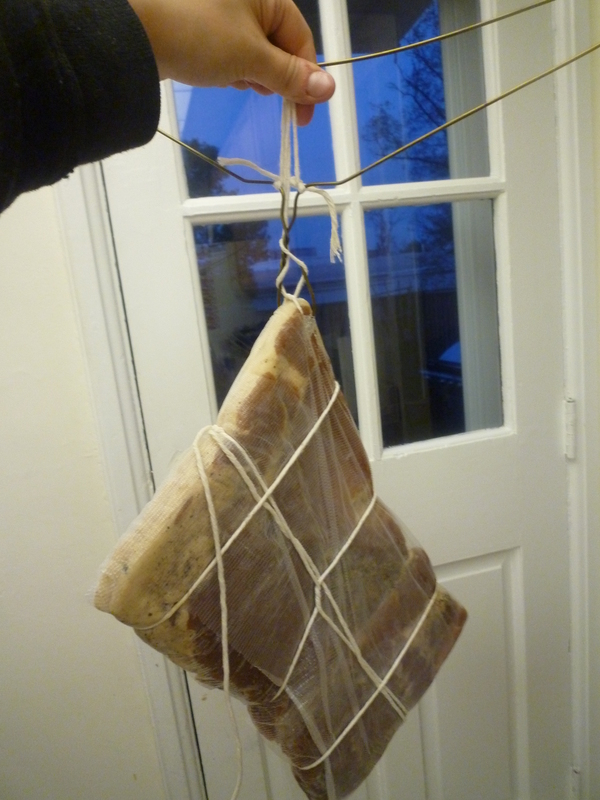 The other, easier option is to wrap the flat belly in cheesecloth, poke a hole in one corner and hang it to dry flat. I went with the latter choice. Ruhlman writes that you can also opt to skip drying and that the pancetta will still taste great when it is cooked, but that the drying phase improves texture, intensifies flavor, and helps it last longer. After drying, the pancetta should be wrapped in plastic and stored in the refrigerator for up to a month, or can be frozen for up to 4 months. Freezing makes it easier to slice thin. Mine just went into the “meat closet” for drying last night, but I’ll post a picture when I cut into it. Yum. Next up? 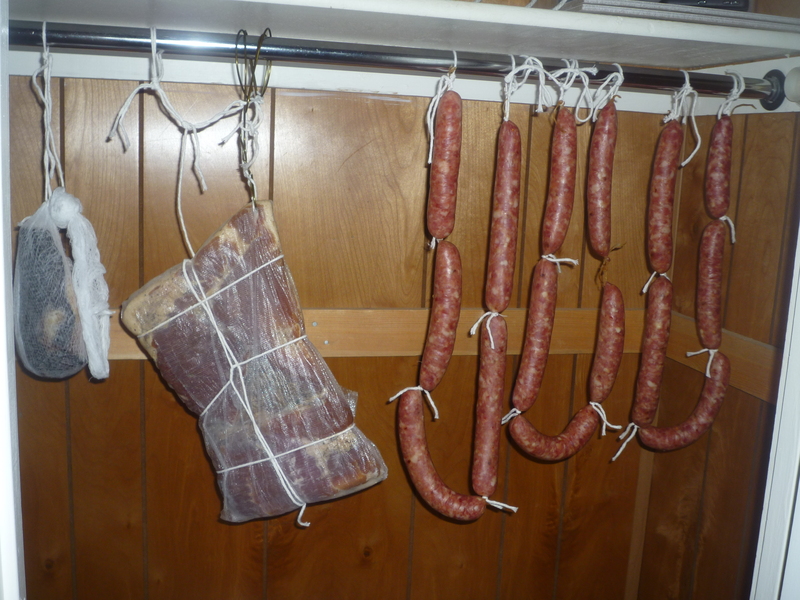 The recipe for those links of soppressata hanging next to the pancetta.